Guido, Redken Creative Consultant, styles hair for more than 80 fashion shows every year in New York, London, Milan, and Paris. He fuels trend-setting hairstyles around the globe every season and is the creative force behind fashion's most iconic hairstyles. For TME Readers, we’ve got the “Get The Look” for NYFW most iconic designers! For the fourth season in a row, Redken Creative Consultant Guido created 60 custom wigs for the highly-anticipated Marc Jacobs Spring/Summer 2015 NYFW show. Working very closely with Marc Jacobs to complete his vision for the runway, Guido drew inspiration from the 70’s and 80’s to create a fantasy on the runway. Apply hardwear 16 super strong sculpting gel to dry hair from root to ends and comb through until hair is completely saturated. Divide hair into two sections (top and bottom) in the back. Clip the bottom section down and out of the way. Using a finishing brush, start to brush the top section flat against the head, following the round of the head in one direction. Repeat with each section, making sure it’s very clean and neat-looking when finished. Blow dry hair until completely dry. Apply control addict 28 high hold hairspray to smooth any flyaways. Cut the wig into a bowl-shape with a heavy bang. Mist water all over the wig until damp, and then liberally spray fashion waves 07 sea salt spray all over, scrunching into hair with fingers to create chunky texture. Allow to air dry and finish by thoroughly spraying wind blown 05 dry finishing spray all over the hair for added texture. 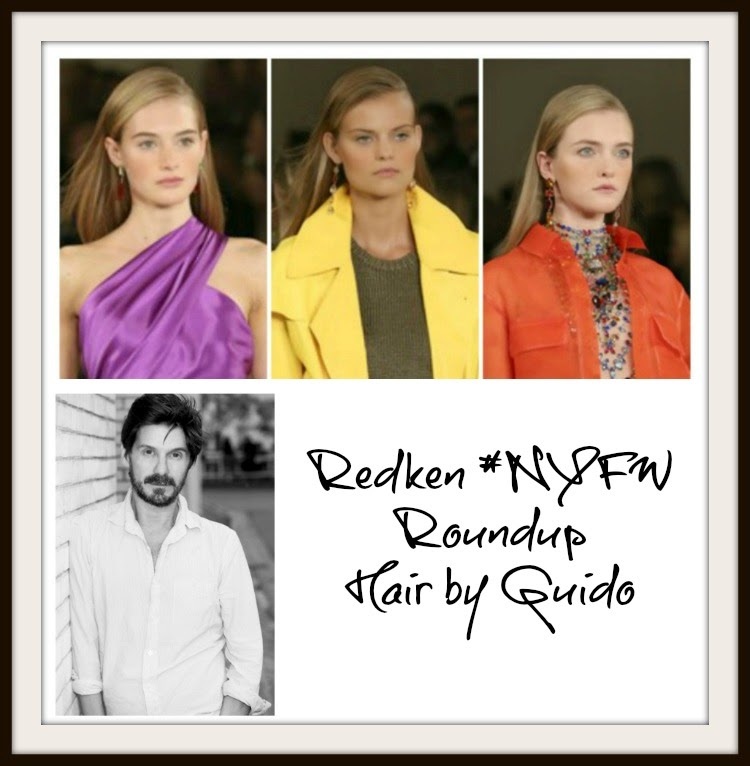 Redken Creative Consultant Guido created a chic, Japanese-inspired chignon for Calvin Klein’s Spring/Summer 2015 NYFW show, adding a bit of toughness to the designer’s classic collection. Liberally spray forceful 23 super strength hairspray and Diamond Oil High Shine Airy Mist throughout the hair, using fingers to work into the roots for texture and grip. Pull hair back into a tight, high ponytail with fingers, securing with an elastic. Twist the length of the ponytail into a tight chignon, fastening with small U-pins and allowing a few wispy strands of hair to stick out from the bun. Finish with another mist of forceful 23 super strength hairspray and Diamond Oil High Shine Airy Mist all over for added texture and shine. 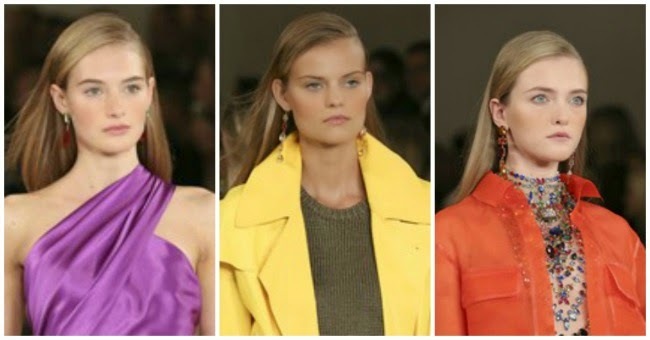 Redken Creative Consultant Guido brought modern luxury to the Ralph Lauren runway once again, creating two classic, minimal looks to complement the designer’s collection. Guido created an elegant low ponytail and a beautiful, smooth blowout to bring to life the timeless, traditional lifestyle of Ralph Lauren. Apply a nickel-sized amount of satinwear 02 prepping blow-dry lotion throughout damp hair. Create a side part and then blow-dry hair smooth using a round brush for added volume. Brush hair into a low ponytail, securing at the base of the head with a small elastic. Take a small section of hair from the ponytail and wrap it around the elastic, securing with a small pin. Finish with a mist of fashion work 12 versatile hairspray for a clean, polished look. Please note, Redken products can only be guaranteed authentic when purchased from a salon. To locate a Redken salon near you, please visit Redken online. For more tips and to stay in the know, checkout Redken on Twitter, Facebook and Instagram!